On February 2-4 (2018), please join us for a special seminar with Sensei Bruce Bookman. Participation is limited to the first 30 people that register with payment. If you would like to pay by check, please drop it in the mail to the dojo address. Use the link below to make an on-line payment. Sensei Bookman holds the Aikido World Headquarters rank of 6th dan, and is the Founder and Chief Instructor of the Tenzan Aikido organization based in Seattle, Washington. He has been practicing Aikido since 1970, and his extensive experience with Brazilian Jiujitsu, boxing, Tae Kwon Do, Judo, Yoga and classical Japanese swordsmanship bring a uniquely dynamic and broad perspective to his instruction. 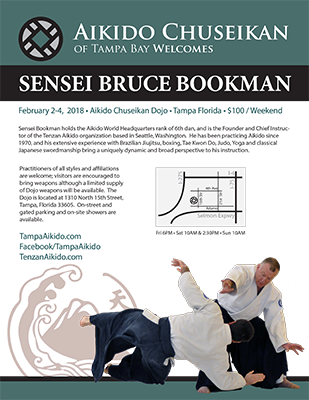 Many local aikido students were introduced to Bookman Sensei when he taught at Shindai Dojo in Orlando during one of the annual Friendship Seminars just a couple of years back. Jet Sensei and Don Sensei were particularly inspired after meeting him and traveled to Maryland in 2013 and 2014 to attend his seminars there. They continue not only to enjoy his wholehearted approach to aikido but are moved by his compassionate attitude and open spirit as well. For an introduction to Bookman Sensei and his teaching, please checkout this video! Please download and share the flyer for additional details, and register early at our Facebook event page – attendance is limited! Practitioners of all styles and affiliations are welcome!